One of America's most respected and honored TV stations is also one of few that still signs off for at least one night every week. This early Sunday morning sign-off is preceded by the final two minutes of the sports show Kick Start. Commercials for HealthMart Pharmacy and Bear Creek Mutual Insurance follow, as well as an anti-smoking PSA featuring the Smokerman action figure. The commercials, PSA and the Siegfried & Jensen time and temperature check ane shown in 4:3 format. The widescreen sign-off follows, which utilizes views of the KSL-TV studio building, news team and the Oquirrh Mountains located near Salt Lake City. Unfortunately, there's a five-second dropout in the audio midway through the sign-off. To fill in the missing information, KSL-TV's transmitter is located atop Farnsworth Peak, which is named for Utah native and television pioneer Philo Taylor Farnsworth.  A stretched-out version of the classic SMPTE color bars follw the sign-off. The Webmaster would love to have seen a widescreen SSB video of some kind used here.